Hun Sen addressed a huge crowd on the final day of campaigning ahead of Sunday’s vote, which promises to be an easy victory for the ruling Cambodian People’s Party (CPP) despite calls for a boycott that Hun Sen decried. Tens of thousands of supporters decked in the ruling party’s white and blue arrived from dawn in the centre of the capital, some on motorbikes and buses, in an impressive show of support. But it will be the only political showing of significant scale ahead of the election after the sole serious opposition was dissolved by the Supreme Court in November. In typically bombastic style, Hun Sen vowed victory on Sunday and took a swipe at his opponents, many of whom have been jailed, prodded into self-exile or gone to ground inside the kingdom since the ruling. “Recently we took legal action to eliminate traitors who attempted to topple the government,” he said of the court ruling that disbanded the Cambodia National Rescue Party (CNRP). A pillar of Hun Sen’s appeal is that he has presided over peace and a level of prosperity since the early 1990s when Cambodia emerged from decades of war and the trauma of the Khmer Rouge regime which killed one quarter of the population between 1975-79. 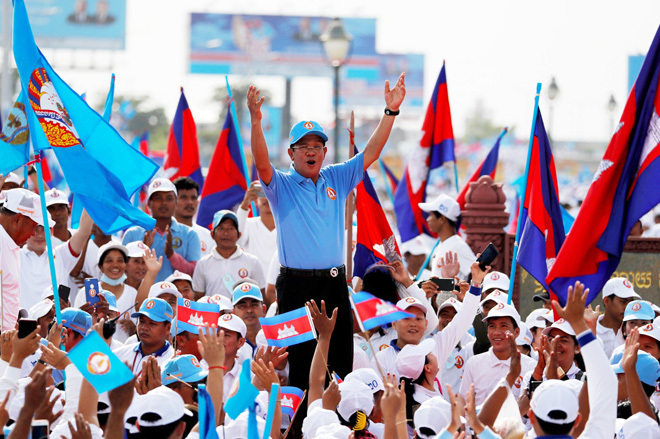 His party has won every election since 1998 while Hun Sen, 65, has maintained control through patronage networks and family alliances. “With the CPP we have growth, we have schools, peace… everything,” said supporter Khun Bopha of a party that now presides over an economy chugging along at a growth rate of around six to seven per cent. The Supreme Court knocked out the opposition after Hun Sen accused CNRP members of plotting against the government. But the crackdown took place after the CNRP performed well in local elections last year, building on the 55 seats they won in parliament in 2013. The opposition, many of whose key members have fled the country, have urged supporters to boycott the poll in a ‘clean finger’campaign — a reference to the ink applied to voters’ fingers by polling officials after they have cast their ballot. Election authorities have said calls to boycott the vote are a ‘crime’ and have already fined five former members of the opposition in northern Cambodia after accusing them of endorsing the anti-election campaign. Hun Sen also warned against the attempt in his speech. “Those against the election are the ones who destroy the nation and democracy and should not be forgiven,” he said. The US and the European Union have pulled assistance and monitors from the poll but staunch Cambodia ally China has stepped in to provide equipment. Cambodia has held six elections including the first UN-sponsored poll in 1993 since the country of 15 million emerged from years of civil war. Hun Sen has cast himself as the saviour of the country from the ravages of the Khmer Rouge, even though he was a former member of the ultra-Maoist group. 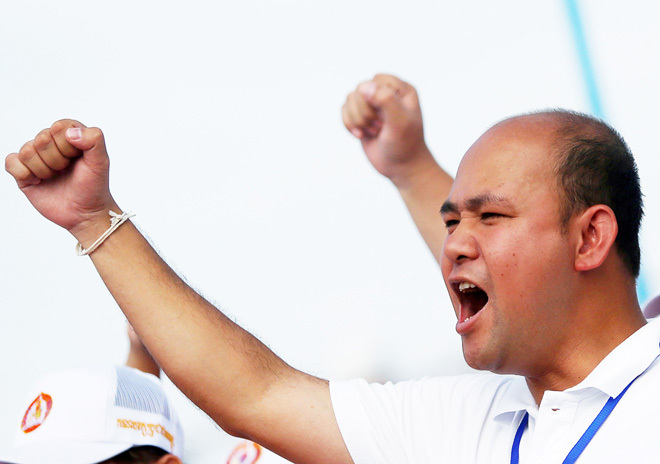 “I love the prime minister because he leads the country in a good way and we have peace,” garment worker Sao Phirun, 32, told AFP at the rally. Asked about Cambodia being a one-party state, she said she didn’t care. Twenty other parties are running but many are of obscure and have been criticised for helping legitimise the ballot, which rights groups have slammed as unfair.